From left, Dr. Daniel J. Connell, assistant vice president regional education and outreach; Artist Jacob Duncan; Michelle List, Kentucky SMP program coordinator; and Jessica Klein, SMP analyst. 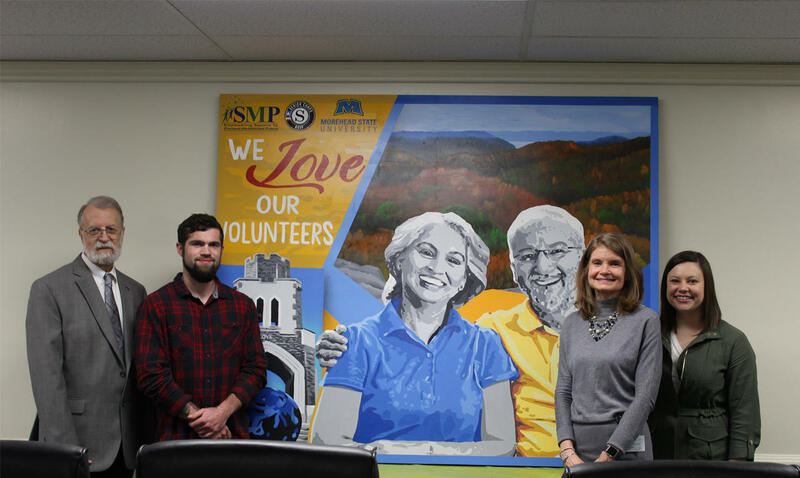 The goal of the SMP Mural Project was to bring together images of the communities it serves to celebrate them and the volunteers that work to empower seniors in a visual way. OSRS describes their work as “applying their vivid, iconic style to turn unused or neglected place into engaging and inspiring artwork, with the mission to brighten the lives of all that interact with it." MSU's mural was unveiled at a ceremony on Tuesday, April 2, at the Educational Services Building in conference room 207. The SMP program is a national program that works to prevent, detect and report Medicare fraud, errors or abuse through outreach, counseling and education. The MSU SMP serves senior citizens in Bath, Boyd, Bracken, Carter, Elliott, Fleming, Greenup, Lawrence, Lewis, Mason, Menifee, Montgomery, Morgan, Robertson and Rowan counties. The program has more than 60 volunteers. “I’m so happy to see a visual celebration of the way Morehead State University engages with the communities of our service region. This is truly a beautiful work of art,” said SMP Program Coordinator Helisha Tuerk. For more information, visit http://www.moreheadstate.edu/smp, email Tuerk at h.tuerk@moreheadstate.edu or call 606-783-2085.